Hello, friends! Or should we go ahead and say Jambo, rafikis! We are so excited that you have found your way over here to our little corner of the Internet. Our desire is that you pull up a chair, grab a good cup of coffee (Jubala, of course), and read all about what the Lord is doing in Kenya. We pray that everyone who reads this blog at any point would be able to look at our experiences and see God's goodness and faithfulness interwoven in them. Thank you for taking the time to join our journey. So many of our family and friends have supported us in every way possible. Thank you for praying for us, for teaching us, for preparing us, and for encouraging us. We love you. Our Story: Our names are Katie and Emily. We are both 19 years old, and we are best friends. We originally met each other the summer before our freshman year of high school (2011) working at New Life Camp, a place that is very near and dear to both of our hearts. We have stayed close friends all throughout high school. 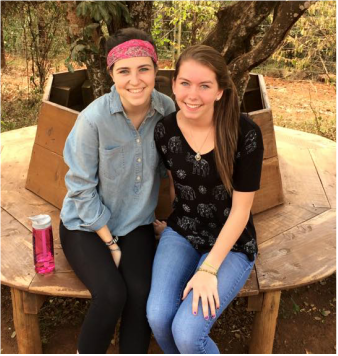 During the summer of 2013, Katie went to Kenya, Africa for two weeks on a missions trip with her church, Bayleaf Baptist Church. It was on that trip that God truly broke Katie's heart for the lost and the least of these, specifically those in Kenya. She realized that God is enough to meet every need and prayed that she would have the opportunity to return to Kenya in the future. Meanwhile, Emily had been praying that God would show her where He wanted her to be after her high school graduation. She knew that she had a heart for overseas missions and Africa as a whole, and she prayed that if God wanted her to be in Africa that He would make it clear. Clear is an understatement. In August 2014, we met with Will Gatling, the missions pastor at Bayleaf, about possibly being mission interns and spending a year in Kenya after graduation. We have watched the Lord continue to open doors for us to go to Kenya and do His work there. It is more than clear that Kenya is where He is calling us. On August 30, 2015, we will leave everything we've ever known behind, board a plane, and move to Kenya for ten months. Please pray for us as we embark on this exciting, yet a little scary, journey. Also pray for the high school students, children, and orphans that we will be serving in Kenya. Pray that their hearts would be open to the gospel and to the grace and love of their Savior. That's our story. But as we sit here and write our story, we realize that it is not really our own. We are living for Someone far greater than ourselves and who is far more capable and good than we will ever be. We are living for Jesus Christ and the God of the Bible. Our story is but a small part of His grand plan and we are only vessels delivering His great news. We pray that His name would be known in America, in Kenya, and all throughout the earth.